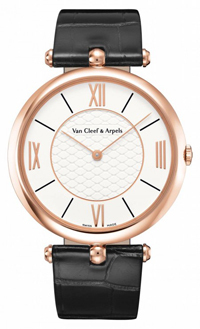 At SIHH 2012 the brand Van Cleef & Arpels had a ‘contemporary interpretation of the timepiece created in 1949 by Pierre Arpels which also bears his name. Pierre is one of three brothers Arpels, the sportiest, the most extroverted. In the picture below is at the center with (from left) brothers Claude ee Jaques. We are in the early ’50s and has established the right wrist watch made in 1949 at her request. Of the three he is looking at the designs of the jewels that come from the studio, which offers new forms and directs the creativity of its jewelers and watchmakers. His watch had to wait years before he finally decided to start building it in series. 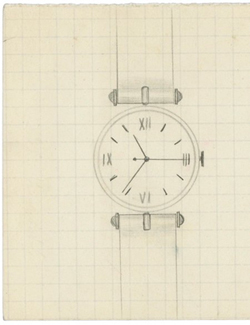 The drawing below – from the archives of the Maison Van Cleef & Arpels – illustrates a draft of the first example. An extra flat round case, an attack very thin underlines the extreme elegance of the watch and wrist, a white dial with Roman numerals of extreme simplicity. The clock that he imagines is a perfect circle, the oldest and most used geometric shapes. “That which has no beginning and no end …”. In the philosophy of Feng Shui, the circle is considered a haven for the spirit, a place to rest the mind and inner growth. The disappearance of the two side ports, which generally connect to the watches classic style straps, allows this model to appear as if suspended in space. His only attachment element is a link of very thin, that Pierre Arpels will fall further, so that its presence becomes almost imperceptible. E ‘for this reason that he wanted an ultra-thin watch. It had to be worn under the shirt as much as discreetly as possible, without creating creases in the fabric, not to be noticed. Businessman, creator, great traveler and sports, so it was Pierre Arpels. At the helm of his boat, during visits to his shop or in the evening under the shirt tuxedo, his watch was always connected to accompany him on his right wrist. Not if they never separated. After having produced a few copies only for close friends, in the end will be marketed in 1971 under the name of PA 49. More than 60 years after its creation, this watch is an icon of the brand. 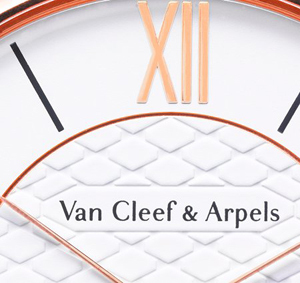 On the occasion of the exhibition SIHH 2012, Van Cleef & Arpels has presented a review of more contemporary whose lines recall the original model and the spirit of its creator. On the round surface of the dial, hours, represented in Roman numerals and indexes individual, stand out for the simplicity of the original model. The dial and always painted white, but the middle and decorated with a pattern reminiscent at the same time the shape of the punch of Van Cleef & Arpels and the fabric of pique coat tuxedo. A new profile, slightly biseaute, accentuates even discretion. The rounded leading, very fine, disposed in the top and bottom of the dial, is still the characteristic element of this timepiece. A simple detail that accentuates the elegance of this watch to your wrist with extreme lightness. The strap is black crocodile shiny, just like Pierre Arpels wanted him. The innovation lies in the assembly of skins: they are now glued by hand to clear the seams. The crown has a diamond. There is also a version with a bezel embellished with pave diamonds DEF / VVS. The new version of Pierre Arpels reflects the class of its creator just like the model that he created in 1949 and almost jealously guarded. Van Cleef & Arpels is a historic brand of jewelry: in its watches before entering the Richemont group has never excelled for the gauges used, exactly the opposite of what is the case today.